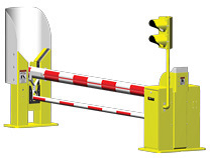 StrongArm M30 is a high cycle, crash tested, fortified barrier arm. This operator runs with the ultra-reliability of HySecurity’s 30 year proven hydraulics, flexibility, power, and reliability of HySecurity’s programmable Smart Touch® Controller, and unique functional and safety benefits. Installation is easy and inexpensive with integrated hydraulics, controls, shallow and deep mount options. StrongArm M30 is available to fit 12 to 24 foot clear openings, is rated to cycle up to 100 times per hour for one vehicle, one cycle applications and runs at six to eight seconds open/close depending on arm length. EFO is two seconds faster.